VIOLENCE INTENSIFIES! RIOTERS ATTACK LANDMARKS! JACQUES CHIRAC DEMANDS A REPORT IN ONE MONTH! To take affect later this month!! 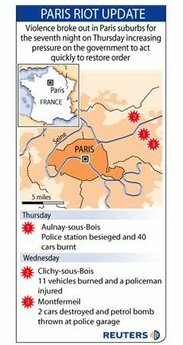 Some 400 cars were set on fire in the outskirts of Paris last night, as serious riots in the city’s outskirts continued for an eighth consecutive night, the police said. Police also reported that 27 buses were set on fire at a depot, and that fires were started at a primary school in the district of Stains and at a warehouse in Aulnay-Sous-Bois. The BBC reports that 500 cars were torched. A group of officers were targeted near a synagogue in the Seine-Saint-Denis area of Stains, where a primary school is partially burned. 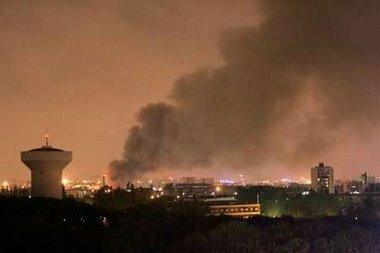 More than 100 firefighters fought a blaze at a carpet warehouse in Aulnay-sous-Bois; another warehouse was also set alight in Le Blanc Mesnil area. And, twenty-seven buses were burned at Trappes depot in Yvelines, west of Paris. Another report counted 240 cars and 27 buses torched on Thursday night! About 240 cars were torched in the northeastern and western suburbs of Paris; 27 buses were set on fire in a depot southwest of the city, local officials said. The number of cars destroyed last night totaled 400, including vehicles in the Burgundy city of Dijon and in the south, Agence France-Presse reported. “There are now copycat actions and imitations,” said Eric Raoult, the mayor of Raincy, a town east of Paris. 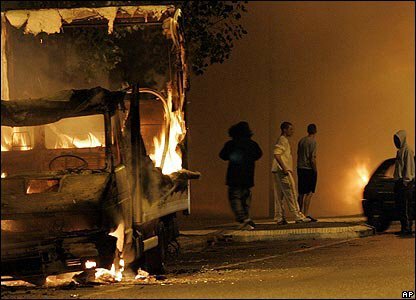 Seine-Saint- Denis, where the riots started, “is a poor region. People need to find jobs, but it’s difficult when your name is Soraya or Kamel,” Raoult, a member of President Jacques Chirac’s Union for a Popular Movement party, said in an interview. The violence reflects tensions in French ghettos marked by youth unemployment of more than 30 percent, poverty and large immigrant Muslim communities in the majority Catholic nation. De Villepin yesterday vowed before the Senate that authorities “will not give in” to the violence and will make restoring order the government’s top priority. “I will not allow organized gangs to lay down the law in the suburbs,” he said. Rioting spreads to over 20 towns surrounding Paris! Rioting among young men of North African and black African origin — mostly locally-born citizens who feel cheated by France’s official promises of liberty, equality and fraternity — began last week after two teenagers of African origin died while fleeing the police. It escalated on Wednesday evening when police and fire crews were shot at with live ammunition on three occasions. Villepin indirectly blamed the riots on gangs he said terrorized residents and sought to keep police out of their neighborhoods. “I refuse to accept that organized gangs are laying down the law in certain neighborhoods, I refuse to accept that crime networks and drug traffickers profit from this disorder, I refuse to accept that the strong intimidate the weak,” he said. Belmont Club has a Google Earth map of the rioting townships. Prime Minister Dominique de Villepin briefed local officials about his new plan! “It seems a bit calmer than previous nights but about 50 vehicles have been torched since nightfall,” said a police spokesman in the Seine Saint Denis area. French media also reported attacks on a school and a bus in northern Paris and on vehicles in two poor areas to the west of the capital. Several cars were also reported to gave been set ablaze in Dijon, the first city outside Paris to be hit. On Thursday evening, local officials complained loudly about dithering and politicking among national officials after Prime Minister Dominique de Villepin briefed them about an “action plan for the suburbs” he aimed to present later this month. Americans for Freedom has more on this “War in Francistan”.